The worst airline ever, Alitalia, has had a busy few months. After continuing to bleed money thanks to Etihad’s failed turnaround plan for the airline, Alitalia went bankrupt and the Italians went looking for someone — anyone — to step in to save the day, just as Etihad had done a few short years ago. Though I expressed an interest in buying the airline for a penny if someone else wanted to absorb its debts, I never actually submitted that plan. But now, word is out that there are 32 parties who have expressed a formal interest. I’m guessing less than half are more legitimate than mine, but they’re being kept confidential for now. I’d bet most of these are a Pan Am-style buffet where airlines want to pick the meat off the bloated carcass and let the rest just sink to the bottom of the ocean, but I suppose there could be a couple of folks interested in something more. The problem first started back in 1946 when Alitalia was founded. Wait, that’s not right. Though honestly I can’t remember when Alitalia’s problems began. After years of turmoil, Alitalia thought it had found a savior in Etihad back in 2014. Etihad came in with a turnaround plan that involved going upscale and tweaking the network, but it was doomed from the beginning. It became quickly evident that the plan wouldn’t work and profit was not right around the corner. It all fell off the rails last year as Alitalia’s dreams of profit were dashed while others smelled blood in the water. Low cost carriers saw tremendous opportunity in Italy and ramped up. Ryanair has been particularly active, even choosing Rome as its first connecting hub. Alitalia continued to flail while it prepared for a stand-off with labor. A desperate turnaround plan was put out there, but it required the unions to go along. To just about nobody’s surprise, they shot themselves in the foot and turned it down. Alitalia is operating off a cash infusion for the next few months while the search for a sugar daddy goes on. As someone who has loved writing about Alitalia since I crowned it the “worst airline ever” in the early days of the blog back in 2006, I find myself pulling for the airline. Why? Well, I just can’t imagine a world without my favorite whipping boy in the skies. Oh sure, there are other candidates for the position as worst airline ever, but none can hold a candle. I received plenty of notes from people asking whether this was the end, and honestly, I doubt it. The Italians have too much pride in their national carrier to realize that it’s completely and totally unnecessary. If Alitalia were to go away, then other airlines — profitable ones — would swoop in immediately and fill the void. When it was announced that there were 32 entities interested in saving Alitalia, I know a lot of people were shaking their heads. Why would anyone be interested? Well, we aren’t sure that anyone truly is interested in Alitalia the airline. We do, however, know that airlines are interested in Alitalia’s assets to get a jump on the competition if the airline went away. This is the Pan Am strategy. United picked off Pan Am’s Pacific network in the ’80s. Just a few years later, it bought the airline’s Heathrow rights. Then Delta bought the rest of the European network while promising to prop up the piddly remains of the airline. That lasted about 5 minutes and Pan Am was gone for good. Do we know that’s what’s happening with Alitalia? Well, we do to some extent. While the bids are confidential, the bidders are welcome to out themselves. And some have done just that. Ryanair, for example, is one of the companies showing interest but it doesn’t want to buy Alitalia. It just wants to pour airplanes into Italy and then feed Alitalia’s long haul flights. There’s no way the Italians will go for that, but they should seriously consider it. Lufthansa is also interested. It has long been an important player in northern Italy with its Air Dolomiti operation that connects Italy with its Munich hub. You might also remember the short-lived Lufthansa Italia operation that flew from Milan to other European cities. That failed, but it shows that Lufthansa is always interested in an Italian opportunity. Of course, Lufthansa doesn’t want a piece of the airline. It just wants its assets – fleet, slots, etc. Air France, a longtime Alitalia partner that has been distancing itself in recent years, is always rumored to be interested, as is Delta. But it’s likely they have the same interest Lufthansa has. Is there anyone who would actually want Alitalia to remain, thrive, and grow? Well, Etihad is tapped out, it would seem. So who do airlines turn to when nobody else is willing to play? Hainan parent HNA Group of course. That company has been buying up anything it sees and is quickly replacing Etihad as the leader of the movement to support failing airlines. I have to assume HNA is sniffing around. The thing is, I will be shocked if the Italians are willing to let Alitalia go. So you might end up with some kind of goofy situation where Alitalia lives on in name only just to placate the leaders of the country while nothing else stays the same. The best thing that could happen to the airline is for it to go away and let healthier airlines step in. But let’s hope that doesn’t happen. I just can’t stand the thought of finding a new worst airline ever. Shouldn’t the victim of the vultures be already dead on the ground ? Well, yes. But you know, it was the best photo I could find late last night as I was trying to wrap this up! I really don’t understand why you think Alitalia is so bad. I have flown with them about 15 times in the last year both within Europe, to the USA and the Middle East, in Economy on domestic routes, Premium Economy and Business. The service has always been great and apart from once the arrivals were all on time. AZ Business is far better than many other European carriers and their Premium Economy product to New York from Rome is very comfortable and excellent value. If you want a really disastrous airline, try Air India. What is wrong with AZ is its financial and marketing management, but its route network, its on the ground and on board product is really very good. It will be a great shame if those elements disappear. I dont think Cranky has ever really criticized AZ’s pax experience, which by all accounts is pretty good. Its the constant bad management and labor decisions and stupidity of the business plan that gets named worst airline ever. You are correct. I’m a regular on their flights to and from JFK / MXP and I can’t really think of anything to complain about. Flights on time, clean planes, food is good and the wine never stops flowing. Harry – What Jeff says. This has nothing to do with onboard experience, and I’ve even written in the past that people should fly Alitalia. But this is an airline industry blog, and as a commercially-functioning airline, Alitalia fails. Just curious, Cranky – have you ever flown on Alitalia? Did they ever reach out to for some sort of event/interview? Oliver – I never have, but we actually had a discussion about it last year. The discussion dragged on too long and the LA seasonal flight was done for the year, so I said I’d reach out again in the spring. I’m pretty sure it’s not going to happen now considering the state of the airline but we haven’t been in touch since then. I think you’re being a little unfair on Alitalia – at least talk to them and give them a right of reply to everything you write on here. I wonder how much their Heathrow slots are worth? I’ve heard it said that “United is the airline Pan Am could’ve been.” So the question is who will come into Italy and run an efficient and profitable Alitalia? Italy, efficient, and profitable are never used together in the same sentence. I recall that when the Eithad purchase was announced, noted here at CF, I opined at that time that the ultimate downfall of Alitalia would be the unions. They are and always have been Alitalia’s worst enemy. Bgriff – Ah the transitive property. So if Alitalia = Worst Airline Ever and Etihad = Alitalia, then Etihad = Worst Airline Ever! Etihad could actually be a candidate since it doesn’t really seem to be running a business. But then again, it’s not Etihad’s fault. Etihad is like the rich teen who was never told how to act right because daddy kept giving him money. I suppose you could say something similar about Alitalia. But with Alitalia it’s more like the kid whose mom keeps telling him how great he is even though he’s flunking every subject in school. There’s just no basis in reality. I guess I am misremembering because I can’t find now that you actually said this, but I had been thinking that part of your argument for AZ being the Worst Airline Ever was that its continued decades-long hobbling along is stopping the Italian (and European) aviation industry from being able to move on with much stronger and more stable players. So from that sense, it’s not even so much the transitive property, but just the fact that Etihad is preventing a half-dozen zombie airlines from succumbing to market forces. Well, Alitalia is just one of many airlines that fall into that category, though it’s probably one of the biggest. Still, Alitalia, LOT, SAS, Czech, airberlin, Aegean, etc. 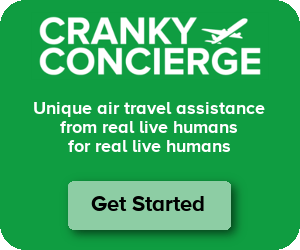 Cranky – what do you think a buyer should be do to shift the direction at Alitalia? NYC-Jeff – Nothing. I think a buyer should be focused on assets and then get rid of Alitalia entirely. Cranky – what do you think a Buyer should do to get things moving in the right direction? But look at the bright side Brent. If Alitalia goes under that will give you more time to write about Long Beach! But if AZ goes under, what will El Papa do if he wants to fly somewhere? I say the Vatican is filthy rich enough to buy a 747-8BBJ. I’m sure it could, but I can think of literally nothing that Francis is less likely to do. El Papa chose a Ford Focus as his vehicle. I think he will be okay with RyanAir. I have to admit, I do feel like Alitalia can get a harsher rap than it deserves. Union troubles and dysfunctional home governments are hardly unique to AZ or Italy and their biggest commercial issue, the split airport situation in Milan and Rome, isn’t even really their fault. In any case, if Abu Dhabi no longer has the cash or the willpower to keep supporting them, there’s always HNA like you mentioned. Hang the airline upside-down with its money-mistress, throw rotten veggies at both, sack Rome….then another pack of lactating she-wolves to suckle the Italians.Capiche? So will there be an ITxit to prevent all these European interlopers from running Alitalia out of business on its own turf? To extent CF’s accurate analogy, Alitalia is the teen that was never told “no” and has now grown up to be an adult. Disconnected teens are bad enough but disconnected adults just plain fail – end up on the street, bankrupt, etc…. Alitalia and its unions never understood that Italy is disadvantaged geographically in Europe and also is competing against airlines that are much stronger, better run, and in some cases supported by more powerful governments. Add in Italy’s own mismanagement of its airport strategies (ie Milan) and it is a combination that the best-run airline would have been challenged to overcome. Etihad will lose a bunch of money but they aren’t investing more. There are no assets that have any value because the debts are far higher. Other airlines will serve Italy. It’s only a question of when politically Italy wants to finally admit that they, like the UAE, can’t support airlines that are not viable in the marketplace. There has been a lull in global airline failures for so long that people have forgotten that they have happened since the dawn of aviation. The proud Swiss never lifted a finger to salvage Swissair, so why should the Italians want to save the black hole Alitalia ? The new Airline will be named Velilltellya Airlines.